Universal Reels with Cellular Phone Style of Universal Strings With Retractable Function. Universal reels are much more easier to swipe through ID card readers, because universal strings are thinner and more flexible. Universal reels or universal retractable reels come with cellular phone style of universal strings. The flexible and durable strings can be used to hook up retractable reels with all kind of small items, such as IDs, badges, ID cards, bottle drink openers, USB flash drives, small meters, perfume sprays, lipsticks, keys, displays and more. The retractable reels come with universal strings can make a lot of small items become retractable. Note: Cell phones are too heavy for retractable reels. They are designed for light weight and small items only. 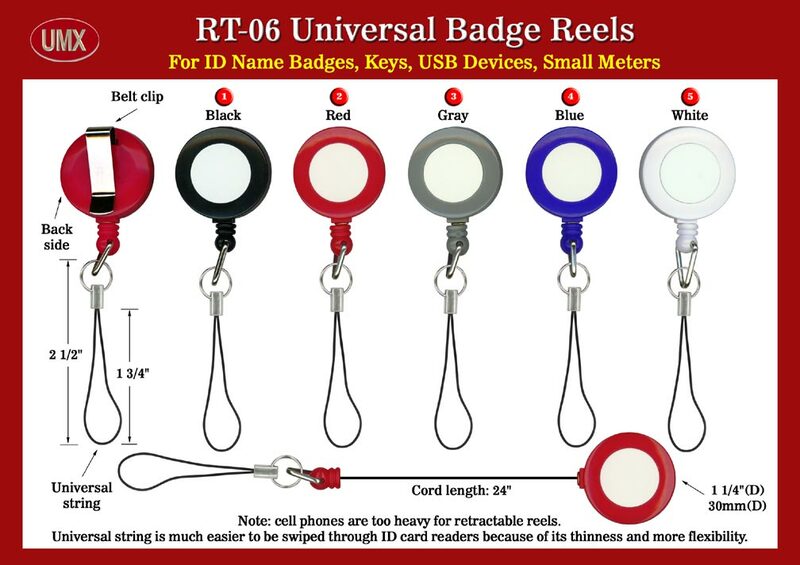 You are viewing Lanyards > Badge Reels > Universal Reels with Cellular Phone Style of Universal Strings With Retractable Function.